The third season of the hit Netflix series “Daredevil” learns from previous mistakes and delivers one of the best seasons in the entire Netflix-Marvel universe. 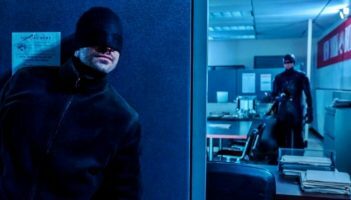 Matt Murdock, played by Charlie Cox, returns as Daredevil and is recuperating after the fallout of the events of “The Defenders” show. But with Matt being out of commission, Wilson Fisk, played by Vincent D’Onofrio, is making moves to take his throne back as king of the criminal underworld of Hell’s Kitchen and New York City. The biggest fix this season was the consistency. Season three had a far more consistent story. It didn’t feel like it was two separate stories, even though there were just as many elements in this as in the second season. The showrunners knew just how to divide the time and make it work for the overall story. The show focuses on the main protagonist, Matt, but isn’t afraid to go away from him to tell someone else’s story, like that of Karen Page, played by Deborah Ann Woll, or Franklin “Foggy” Nelson, played by Elden Henson. This season gave these characters more depth and the audience has a reason to care for the character other than just being Matt’s friends. The show also takes time to develop new characters like Rahul “Ray” Nadeem, played by Jay Ali, an FBI special agent who is using Fisk as an informant to try and get crime syndicates out of the streets of Hell’s Kitchen. The show also introduces Ben “Dex” Poindexter, played by Wilson Bethel, who is also an FBI agent and friend to Nadeem and serves as a parallel to Matt, having similar back stories. Dex plays a big role in the season, not only to Matt, but to Fisk as well. In this season, Matt goes to prison to try to get information on Fisk and is sent to the nurse’s office after an altercation with a prisoner. As soon as the scene begins with Matt waiting for the nurse, there are no more camera cuts, and the camera is focused on the action. But the scene wasn’t just all non-stop action. There were moments where Matt rests and finds the information he needs on Fisk and then the fight continues to escape the prison. The viewer might say “Wait this scene isn’t over yet,” as the scene is 11 minutes long. The fight choreography is one of the best in any show because they don’t feel choreographed. When Matt fights, the audience can feel the weight of every hit he makes because he is trying to survive or is intending to hurt. The fights always look grimy and real. It never feels too clean. Cox’s performance in this season shined above everyone elses. His loss of faith and apathy is a departure for the character and Cox performed it beautifully because when he did blow, it felt genuine. The climax of the season in episode 13, titled “A New Napkin,” showed what Cox is made off as an actor and will leave viewers with goosebumps. There aren’t too many complaints about this season. The season did start off slow, but it needed to establish where all the characters are in their lives as well as introduce new characters. But when the season starts going, it goes. Some characters take a backseat, like Poindexter, later in the season but it is for a reason. The showrunners never did anything without purpose or reason. The only thing that was problematic was the last scene of the finale. It came off as cheesy. Overall, this season has to be one of the best of the “Daredevil” series and shows why this is the superior show in the Marvel-Netflix universe.